*This is a collaboration with Marriott Hotels. Post contains affiliate links. We are currently in the unfortunate position where Steve works until 8pm on a Friday and I work 12 hours on a Sunday. This doesn't stop us going on little adventures over the weekend and we always try and make every minute of the weekend count. We have been full of busy this week and Steve has been working extra long hours and we've all missed some time together. 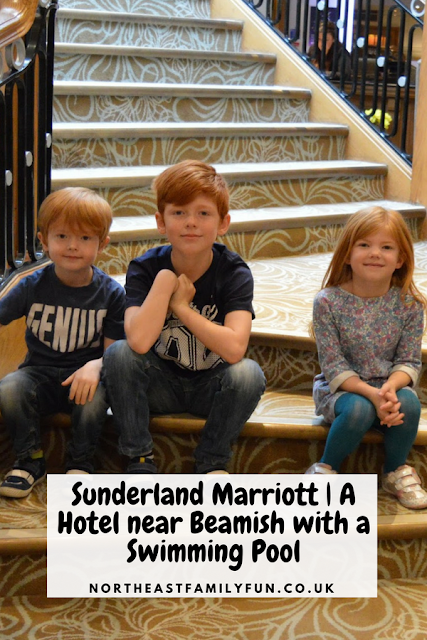 We decided to book the Sunderland Marriott Beamish package (no longer available) which included an overnight stay at the Marriott, breakfast and tickets to Beamish. Although it was only for one evening, as the hotel is on the seafront in felt like a proper little holiday. This package is no longer available so now, you'll have to book your room and tickets separately. You can get some pretty good overnight deals. We arrived when Steve finished work at about 8:20pm on Friday night. The staff were ever so friendly asking us about our journey and plans for the weekend. Our room had been set up for 5 people with two double beds and a single bed plus a sofa, chair and large family bathroom. It was warm and welcoming and perfect for us. I had already eaten with the children but as Steve had just finished work he was starving and ordered a burger and a couple of Pepsis from room service. Both were very good and quickly delivered. I had thought ahead an planned a little midnight (or 9pm) feast for the children. Whenever we stay in hotel's I always do this as a special treat and the children really appreciate it. Before long it was time to draw the curtains, read our books and settle down for a very good night's sleep. Our beds all had individual reading lights which were useful when our youngest went to sleep. I had hoped for a lie in the next day but I don't know what happens to your body clock when you're a parent - as always I woke at 7am. It was nice knowing that we had a 12noon checkout and breakfast was served until 11am though as we could enjoy a lazy morning snuggling up watching cartoons. We loved our view as we opened our curtains too. We headed down to the restaurant for breakfast and couldn't resist a snap in the beautiful hotel reception. Breakfast was everything you would expect from a 4 star hotel. There was a selection of cereal, fruit, yoghurt, cheese, hams, juices, cooked items and pastries for guests to help themselves to. Service was with a smile and I LOVED the extra touch of the children being brought their own pot of hot chocolate for our table. Lovely! The hotel restaurant is overlooking the beach so of course we had to head outside for a walk along the promenade before checking out. We had been given our tickets to Beamish at check in. It is worth noting that these special tickets admit you for one day only and are not the same as the annual pass you would buy at Beamish. We LOVE Beamish. You can see in our previous reviews from Summer 2014 and Christmas 2013 which were completely different to our trip this time that there is always so much to see and do. 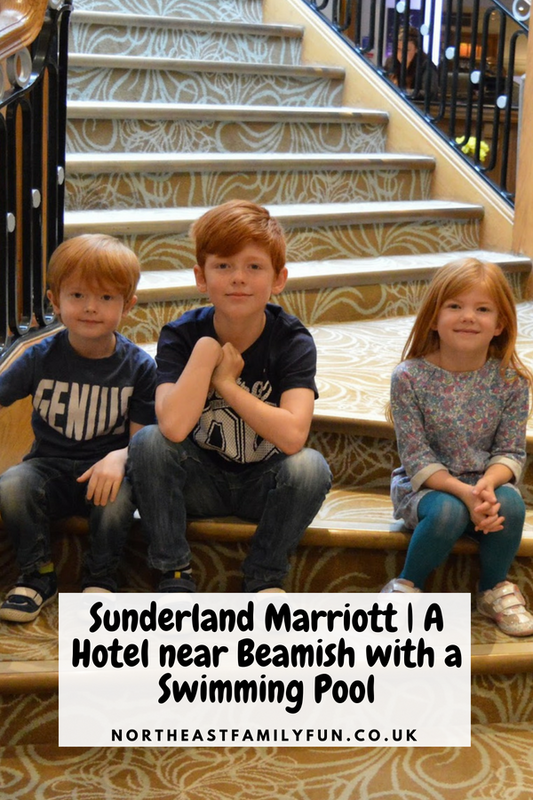 Beamish is about a 30 minute drive from the Sunderland Marriott. Beamish is a living museum and recreates how people lived in the 1820's and 1900's and 1940's. It is more of an experience than a museum as you get to walk around towns and villages as they once were, chat to real people in character, smell the unique scent of a Victorian dentist and traditional bakers and even taste some traditional cinder toffee as it is being made. The first experience for most people though is to jump aboard one of the trams which is exactly what we did. Our first stop was the 1900's town which takes you back to life in the North East just before the first world war. I won a coconut on the coconut stall. The sweet shop and bakers in the town are fantastic - not only can you see various treats being made using traditional methods, you can also sample pieces yourself and then buy the finished product from the traditional shops. We couldn't resist treating ourselves to some fudge. Next up was the steam railway - as with the trams and buses, your ride is included with your admission and everyone enjoyed the short trip along the tracks. We then caught the vintage bus to the 1940's farm which is set around the time of the Second World War. We stopped for drinks from the farm cafe and to sample our Beamish fudge we had bought from the sweet shop before checking out the farmhouse and animals. As an extra special treat there was a folk band playing in the farmyard during our visit. Next up was the 1900's pit village and colliery. I think this may be my favourite part of Beamish. I love wandering in and out of the houses - you really get a sense of what life was like and you walk down the back lanes and marvel at the garden patches. I always enjoy the old school house too where you can play traditional games and take part in a 1900's lesson. There was a lot more we could have experienced - we have yet to try the famous Beamish fish and chips and we didn't go down the mine or visit 1820's Pockerley on this occasion - we will save that for next time! We ended our day the way we had started - with a ride on the tram which was definitely our children's favourite part of the trip. We had a lovely weekend and I cannot recommend combining a trip to Beamish with a stay at Sunderland Marriott enough. 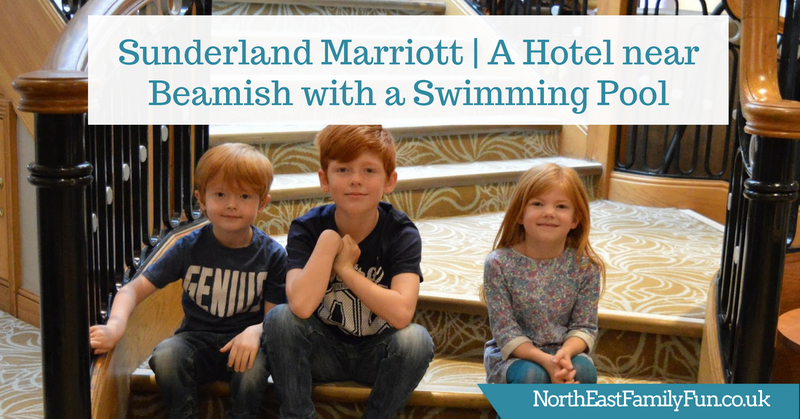 Check prices and book the Sunderland Marriott Hotel here. Sounds like you had a brilliant break, even if it was only overnight. Beamish sounds a lot of fun too. Looks like you had great fun making precious memories :) Great photos! I go to Sunderland quite a lot but don't know that hotel.I will look out for it the next time I'm up that way you look like you had a lot of fun. What a fab hotel. I love beamish, it's such a great family day out isn't it. It really is - I think we'll be back over Christmas. I love the sound of Beamish, sounds like loads to explore - and what a great mini break. Nice work with the coconut too! HAHA yes I was rather proud of my coconut win! Looks like you had an amazing time! When I was a child, it was always a real treat to have a Kinder egg! Oh yes - they are my children's favourite treat! Oh wow, the hotel looks fab. The food looks amazing. I love the midnight snack! Looks like you had lots of fun! Beautiful hotel and stunning places around, definitely a place I would visit! We still haven't made it to beamish this year. Hopefully at Christmas! Your photos are fab and your new hair so suits you!